Changzhou Fuyue Weight Co., Ltd. was established in 1979, and is one of the oldest and largest professional weight manufacturers in China. For the time being, products of the company are sold all over China and exported to 27 countries and regions. The company designs and produces various weights for many well-known OEMs/ODMs. The brand of Fuyue has been recognized and selected by increasing customers, which is evident to show the strength of Fuyue Weight. Fuyue Weight Co., Ltd. occupies a floor space of 15,000 square meters and a production area of 8,000 square meters, and is equipped with complete weight manufacture and weight inspection equipment as well as all kinds of professionals. For many years, Fuyue Weight Co., Ltd. sticks to the idea of providing the best products and service, such as improving its technologies and producing every single product elaborately to make it the best product, taking every single order and every single request of customers seriously to offer the best service for customers with heart and soul. In order to continuously satisfy the market demand for weights both in China and overseas, Fuyue Weight has constantly developed products of high technical content, high added value and high quality. Nowadays, Fuyue Weight is taking the lead in the domestic industry in terms of scale of production, product quality and sales volume. At present, Fuyue Weight Co., Ltd. has 30% products for direct sales and 70% for indirect sales, the sales volume in the overseas market higher than that in the domestic market. In the site of this exhibition, He Zhimin, General Manager of Fuyue Weight Co., Ltd., said that the company has participated in the InterWEIGHING almost every year since its establishment, and is a loyal exhibitor here. She said InterWEIGHING was an indispensable cradle for the development of weighing apparatus manufacturers that witnessed the growth and expansion of many companies. The exhibition has helped to drive the growth of the industry and a number of emerging companies. InterWEIGHING has made undeniable contributions to the development of China’s weighing instrument industry today. These years in particular, with larger area, more beautiful booths, the exhibition has gain more popularity. 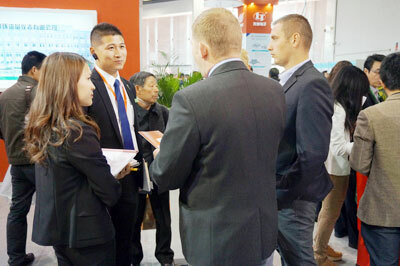 Compared with three or five years ago, the exhibition is more than doubled in scale, and it now has become the world’s largest professional exhibition for weighing instrument industry where all customers can meet their desired buyers and sellers from both at home and abroad and get the latest domestic and overseas industry information. It’s very important for the development of enterprises, especially for those small-size ones that have just started business. He Zhimin also said, Fuyue Weight Co., Ltd. jointly rented only one booth with others tentatively when it participated in InterWEIGHING for the first time, and unexpectedly, it was a great success. Then the second year, Fuyue rented an independent booth straight away. Fuyue originally intended to increase the booths to 6 or 8 this year, but since it was in a hurry, the plan was suspended until next year. She also told an unforgettable story: a customer who was not actually a buyer of Fuyue Weight came to the booth of the company after paying attention to it for three years, and said to He Zhimin in sincerity, “I’m not your customer, neither do I have the demand to buy your products, but I’ve been paying attention to your company for three years, and I noticed that your company has made rapid progress. Your company keeps changing and making progress every year. I’ve also seen many other products of the same type, but your products are with the best quality.” Though this customer hasn’t bought a single product from Fuyue Weight, his attention and recognition on Fuyue was great encouragement for the company. He Zhimin said, many of the professional visitors here are the company’s direct customers, and there have been increasing acquaintances in the exhibition for over ten years. The exhibition is such an important support for the weighing apparatus industry that many large-scale enterprises today have grown up from this cradle. Speaking of her expectation for the weighing exhibition, He Zhimin said, as an exhibitor, she hoped the exhibition could be held in first-tier exhibition cities such as Shanghai some day. She also hoped that the threshold for the exhibition could be higher and it was suggested in the booth distribution that the best brand be provided with the best location.